During the month of August, the Authority participated in two Duke Energy curtailment events. The Authority’s Kings Bluff Raw Water Pump Station participates in Duke Energy’s Demand Response Automation (DRA) curtailment events. The DRA Program provides participants' with energy cost savings incentives to curtail energy use during periods of peak demand. During these events, the Authority reduces its electric energy use by switching to alternative power by use of its emergency backup generators. In each calendar year there is a maximum of 10 total curtailments with a minimum of 3 summer curtailments events. During these events, the station curtails its usage of electrical power and operates solely off of generator power for periods between six to eight hours. 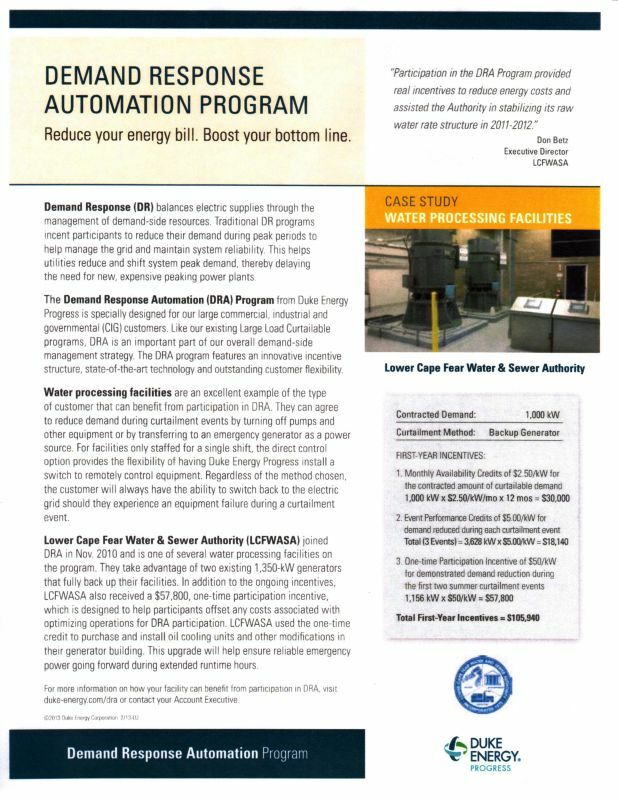 Below is a case study prepared by Duke Energy showcasing the Authority's participation in the DRA program.